Easy jet celebrates 30 million passengers from Glasgow Airport. Base captain Mike Leslie, passengers Roy and Maureen Scott, and Glasgow business development manager Paul White. LUTON, UK, 2017-Jul-04 — /Travel PR News/ — easyJet, Europe’s leading airline, has today celebrated carrying 30m passengers from Glasgow Airport. On 10 November 1995 easyJet’s first ever flight, EZY121 operated by a Boeing 737-200, took off from London Luton for Glasgow with Captain Fred Rivett at the controls. Since this first flight easyJet has remained committed to the airport by maintaining a continuous operation and flying over 30 million passengers to and from Glasgow. The airline celebrated the significant milestone by giving three lucky passengers a pair of flights from Glasgow. Other celebrations, including cake giveaways, happened at the airport throughout the day. The airline continues to see strong growth at Glasgow and now has an unrivalled network of 19 routes and bases 4 aircraft at the airport. easyJet is the largest airline in Scotland carrying almost one in four Scottish travellers and in calendar 2017 will grow further with an increase in the number of seats on sale of around 5% to over 7.4m. Additionally, in March 2017, the airline positioned a second A320 aircraft in Glasgow and is also retrofitting its current Glasgow based A320 to a 186 seat configuration. The airline offers a diverse portfolio of routes in Scotland catering for outbound and inbound demand. Passenger traffic is an almost equal split in directionality with nearly half of passengers travelling inbound to Scotland delivering significant investment into Scotland. “Glasgow is very close to our hearts as our first ever flight operated from London Luton to Glasgow and I am really excited that we have flown our 30 millionth passenger from Glasgow today. “We started with fares to Glasgow from £29 – or as we advertised at the time, the same price as a pair of jeans. A pair of Levis 501s will now set you back £75 while our fares to Glasgow start from £21.24. “This is a fantastic milestone for us. We have come a long way since the launch of our first flight 21 years ago and since then Glasgow has remained a key market for easyJet. 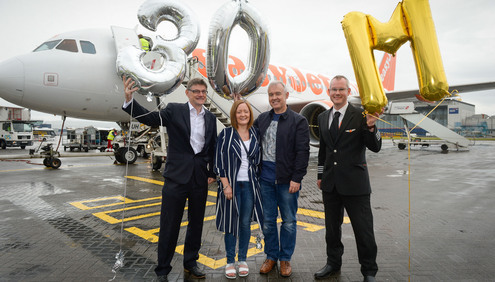 Paul White, business development manager at Glasgow Airport, said: “We are proud and honored that easyJet chose to mark this momentous milestone here at Glasgow Airport, back where it all began. Around 60% of the airline’s total capacity is UK domestic, with over 30% of seats linking Scotland with some the largest European cities, including Amsterdam, Paris, Athens, Milan, Prague and Berlin. easyJet also offers alternative destinations such as Iceland and a range of ski routes including Lyon, Grenoble and routes to Geneva from Glasgow, Edinburgh, Aberdeen and Inverness. easyJet remains committed to providing easy and affordable business connections between London and Scotland and to serving Scotland by offering customers low fares and a convenient schedule for both leisure and business travellers. easyJet operates 840 flights in and out of Scotland per week in peak summer and now flies over 6 million passengers to 44 airports in 18 countries from Scotland. easyJet flies on more of Europe’s most popular routes than any other airline. easyJet carries 75 million passengers annually, of which around 20% are travelling on business. easyJet flies over 250 aircraft on more than 800 routes to over 130 airports across 31 countries. More than 300 million Europeans live within one hour’s drive of an easyJet airport. easyJet aims to be a good corporate citizen, employing people on local contracts in seven countries across Europe in full compliance with national laws and recognising their trade unions. The airline supports a number of local charities and also has a corporate partnership with UNICEF which has raised over £8m for the most vulnerable children since it was established in 2012. This entry was posted in Airlines, Airports, Flights, Travel, Travel Services, Travelers and tagged easyJet, Glasgow Airport, Paul White, Sophie Dekkers. Bookmark the permalink.